A glance at the clock tells me we have just three minutes to get our coats and lunches and line up. Students are still writing, but now there is no time to gather and share. I sigh, realizing this has become a pattern; without a clear plan for making the share happen, it often does not. There is so much to plan for in an instructional school day. Elementary teachers, like myself, teach every subject to often large groups of students with diverse abilities. Thoughtful planning of every subject is essential but is also challenging when so much is on our to-do lists as teachers. 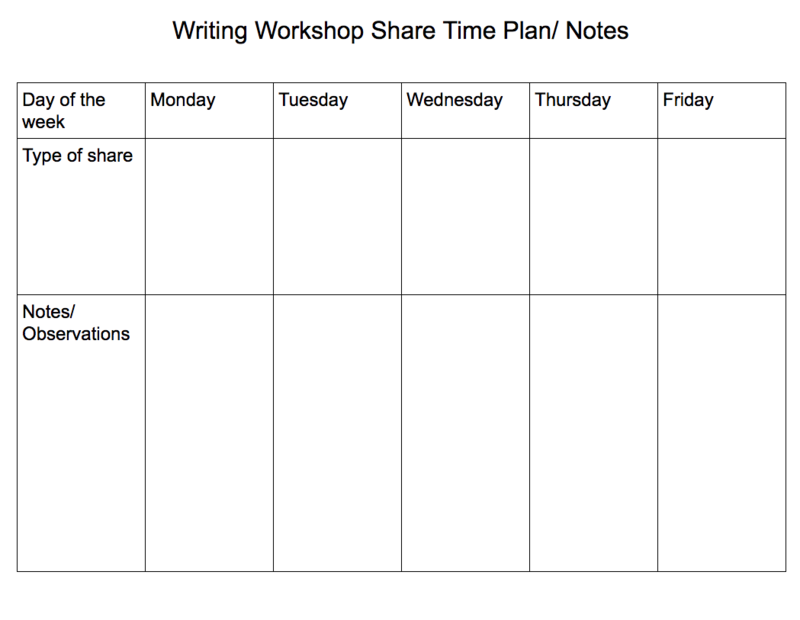 For me, I’ve gotten into a habit of often skipping the share in writing workshop, and this is the year I’m going to turn it around and make share time a priority! Why make share time a priority? When I have a pedagogical question, I go to the experts and read what they have written. Here are some quotes from educators that emphasize why share time needs to be priority. Share time is when we gather as a learning community and discover more about each other as writers and people. This will spill over into all the other work we do as a learning community. Having reaffirmed in my mind that share time is essential in the classroom, a plan will help me make sure it actually happens. Obstacle 1: I don’t know what the share should look like. Whole class? Small groups? Partnerships? Are kids sharing writing each day? As I’ve been exploring this topic and reading professional texts and blogs about students sharing, I think a structure will help me to make sure that each day students are talking about their writing. 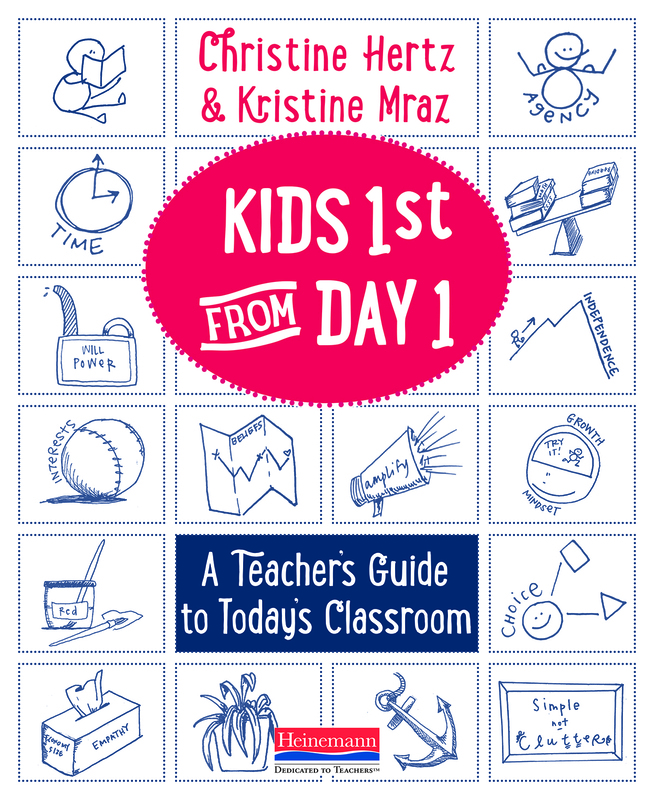 While I structured the slides to coincide with the days of the week, you could certainly remove the days and just create a list of possible shares: Mentor Texts, Mindset, Technology, Wondrous Words, etc. You and your students (or colleagues) could come up with your own list of possibilities for shares and keep it handy for those times when you feel unsure of the best way for students to share that day. I also created this form to help me plan my share sessions for the week and have a place to record my noticings, future minilesson ideas and/or information about individual students. Click on the image to go to the document. You can print this and add it to your toolkit or post it near your meeting area. Obstacle 2: I run out of time! Set a cell phone alarm to leave yourself enough time for the share. Put students in charge of remembering the share. It could be a classroom job to let the teacher know when it’s time to transition to the share. Play a song that would let the writers know they need to wrap up what they are doing and go to the sharing circle by the time the song ends. I’ve come to realize my job as a teacher is not to erase all possibilities of conflict but instead to teach students what to do when conflict inevitably arises. A learning community needs to struggle with some of these questions and concerns to figure out the best way to help each other grow. By allowing my students the opportunity to navigate these relationships, I’m teaching them how to handle conflict and find solutions, which will not only help them in writing workshop… it will help them in life. If I’m committed to making share time happen every day, I also need to commit to teaching students how to be writing partners and how to solve problems that will likely arise. Understanding why share time is so vital to writers was my first step in making the commitment to share each day. Now I firmly have the WHY in my mind, I have come up with the WHAT and HOW we will share. I will put some procedural minilessons in place so students understand how to transition for share time and how to work with a partner. With a plan in mind, a way to keep track of my noticings, and my goal made explicit, I will make sure to leave enough time each day for my writers to reflect, listen, talk, and share their writing. How have you made share time a priority in your writing workshop? *Thanks so much to the many generous educators who replied to my tweet and inspired my thinking in this post, including Dr. Gravity Goldberg, Michelle Haseltine, Erika Victor, Scott Fillner, Lisa Corbett, Peter Anderson, Betsy Hubbard, Ona Feinberg, Kristen Picone, Stacey Riedmiller, Andy Schoenborn, Jennifer Orr, and Angie Wake. ← This is the year I’m going to organize and grow my mentor text collection. I love this post, Kathleen…probably because I can completely relate. I played around with “share time” a bit last year, trying to bring more meaning to the experience. One of the things I did was to create “Playbooks.” The first Playbook is named “Caboodle” and consists of two students paired up. The second Playbook is named “Swarm” with students working in a group of three. Finally, the third Playbook is named, “Clambake”, which consists of groups of four students. I did this because I believe there is huge value in sharing with various people and in various group sizes. (The students also have plenty of opportunities to share with anyone they wish.) Now, when I want the kids to share, I announce “Clambake” and they gather with the corresponding group. Why the wacky names? Just for fun. Throughout the year, I may adjust the groupings as I get to know my learners. Thanks again for writing such a great article. It will be added to my Diigo account to be read over and over again! Wow! I LOVED this post! So timely and informative. I plan on using it as I help teachers to see the value of the share. I appreciate the different focus of each day’s ideas and the quotes. Those are some powerful quotes that support the need for share. Thank you! I read Don’t Forget to Share by Leah Mermelstein this summer and it was so helpful and inspiring. I can’t wait to incorporate the different types of share sessions in writing workshop this year. Powerful!! As I go into a new teacher training this week, I’m now changing my presentation to make sure that “Sharing” is an integral part of each teacher’s lesson and not the after-thought or add-on! Thanks for the reminder! Thank you for helping me see greater value in sharing! I believe in the power of share time. And you have such great ideas for making it a positive, profitable time. I love the day by day ideas to establish a focus routine. It fits well with the spaced repetition I strive to incorporate. This post is a resource I will share with others. Thanks! Thanks for sharing a possible 5 day chart. This will be helpful for my teachers. I always encourage teachers to leave time for share. Looking forward to teaching and supporting both readers and writers in my 5th grade ELA class this year. I like the ideas for having a different sharing “theme” for each day of the week. I can’t wait to share this with my team. Yet another super applicable post! The possible obstacles you identify are exactly my problems! Great post and great resource. I am going to share this with my teaching partners. I’m always looking for ways to make our time impactful and I see this as an excellent way to spend a small part of our day with maximum results. Wonderful information to share with all teachers. I love the Share Time chart! Excellent tips! I really do want to make this a good year for sharing. Some years it’s good in my class, and other years not so much. Last year was not good! I love the idea of having a focus on a type of share each day of the week. Do you have everyone share over the course of the week, or do some kids opt out? That has been one of my questions: What to do with the child who NEVER wants to share, even with a partner in a one-on-one meeting? I have also found value in changing partnerships with each unit. I also started putting less time toward creating perfect partnerships. I decided to randomly pair students with a few exceptions. I learned to think of the moments when the students weren’t getting along as important teaching moments instead of annoying disruptions. There have been some new friendships developed from random pairing with students who previously didn’t know each other well. Thank you for sharing your reflection on share-time. I’ve had the same difficulties in my classroom, and I having a weekly plan is a great idea. School begins in two days, and reading all the goal setting blogs have been a wonderful way to refresh my energy. This post is timely. At a PD session last week this was a topic brought up amongst my colleagues. I know many of us purposefully set goals to be more intentional when it comes to the share portion of workshop. I appreciate the specific suggestions in this post to enable me to meet my goals for this year. Thank you! This is the hardest part for my teachers for the same reasons. During post conferences after observations, I always remind them of the power of closing workshop with a share. This post really will help me offer great suggestions. Thanks. I’ve been looking forward to reading this post ever since I saw your tweet and the thread of comments. Improving share time is one of my big goals this year and this article is a wonderful resource. I so appreciate the time and thought you’ve given to this and I’m so excited to put some new emphasis on share in my classroom! Ah, your posts are always just what I need to read! We started school last week and are easing into routines, so have not started writing partnerships yet, but his week one of our sessions will be “what am I looking for in a writing partner?” This way they will hopefully choose partners for a purpose. Our first unit is on decision making and how our decisions affect us and others and involves developing partner and group work skills, so a perfect fit. I like the idea of “theming” a share when there is not a natural share from the work of the day, so will definitely use this!